A portable electronic device which a cuff that is wrapped around your upper arm. 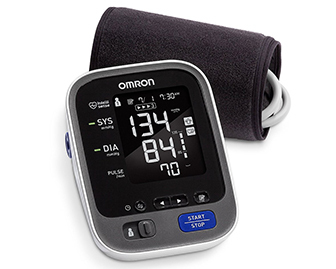 Great for monitoring one’s blood pressure outside of a doctor’s office and is a staple in many homes of people that suffer from high blood pressure or have heart conditions. 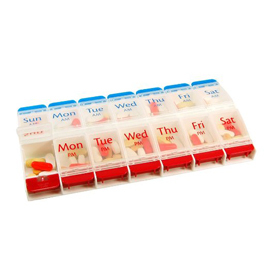 A plastic organizer where medications can be transferred into boxes for specific times and days of the week. It is great for minimizing medication errors, especially for people on many medications. A device that provides auditory cues, which can be programmed at specific intervals to alert a user to take their medications. 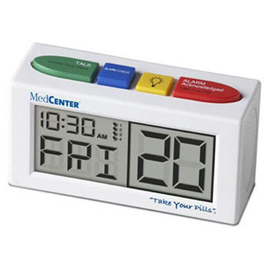 Great for people with mild memory impairment that need reminders to take their meds.